Why don't my daffodils flower? When daffodils and other bulbs don't produce any flowers they are called 'blind'. That is, the flower bud that should have been produced during the previous year, for some reason wasn't or was destroyed. It isn't – as some people believe – a permanent or "inherited" condition. It mainly happens due to poor or incorrect growing conditions and care. Providing you buy large, good quality bulbs, and plant them correctly as soon as possible, they are guaranteed to flower in their first year since they come with the flower bud already in them. There are a number of reasons why daffodils don't flower – or come up blind in subsequent years. 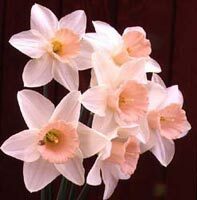 Narcissus (Daffodil) 'Passionale' is a superb cultivar with gorgeous pink colouring on the trumpet. Keep it, and all your daffodils, flowering year after year by following these easy tips. The bulbs haven't been planted deep enough, and during the summer - especially dry summers - the flower buds dry out and die. Solution: Dig up the bulbs in April/early May (certainly before the foliage dies right down or you may not be able to find them) and plant deeper. There needs to be at least two times the height of the bulb of soil above the bulb. That is: if the bulbs are 2.5cm (1in) tall plant them 7.5cm (3in) deep; that is 5cm (2in) of soil above the bulb. As daffodil bulbs age they go through a lifecycle. The large flowering (mother) bulbs multiply every year or so to produce much smaller, younger bulbs – or bulblets – that aren't large enough to flower. The mother bulbs then die and it takes a year or so for the smaller ones to reach flowering size. Solution: Keep the bulbs well fed - add a granular high potash feed in early March, and liquid feed with Phostrogen, Miracle-Gro or similar liquid fertiliser every 10-14 days after flowering and until the foliage dies down. And plant a few bulbs every year, so they don't all reach the same stage in this lifecycle at the same time. The foliage wasn't allowed to die down naturally. Because daffodil foliage – as it ages – looks ugly, many people cut it off or tie it in "neat" knots. This prevents the essential food that the leaves make, building up the bulbs' strength for the following year. Solution: I know it may be difficult, but leave the foliage alone until it dies down naturally, or remove it no sooner than eight weeks after flowering finishes. Also, remove the developing seed pod to prevent plants wasting energy on producing seeds. Warm, dry springs can result in poor flowering the following year, as the bulbs haven't grown enough to develop the following year's flower buds. Solution: Water the soil/compost when needed when the bulbs still have foliage, to prevent it drying out. Feed every 10-14 days with a fast-acting liquid fertiliser too. The flower buds have been eaten by the larvae of the narcissus fly. Solution: There's nothing you can do for the current year's display, but you can protect the bulbs for the following year. Hoe regularly around the plants to kill any larvae, and to make sure there are no large cracks in the soil around the bulbs down which the adult narcissus flies can crawl. Be careful not to damage the bulbs. Cover the plants with fleece – burying the edges in the ground – to prevent the female adults getting to the bulbs. 1) Feed weekly or fortnightly with a liquid feed, such as Phostrogen or Miracle-Gro, from flowering until the foliage naturally dies down. These two feeds are also foliar feeds, so water onto the foliage as well as over the soil around them. 2) Always allow the foliage to die down naturally or leave it alone for a minimum of eight weeks after flowering. 3) Hoe around the plants regularly to prevent damage from narcissus fly larvae. 4) Check the bulbs are planted deeply enough. If not, lift them and replant in good, well-prepared soil. Making sure they are planted deep enough. This should encourage the plants to flower the following year - and every year.